Rising below Kangaroo Hill in the Budawange range as apart of the Great Diving Range, the Clyde river generally flows southward and stretches over 100km in length. With no polluting industries surrounding the catchment and no sewerage outflows, the Clyde river has a reputation for being clean with very good water quality. The Clyde-Jervis Bay catchment is located on the New South Wales south coast and has a catchment area of 3,260km2. Milton, Ulladulla, Batemans Bay and Sussex Inlet. 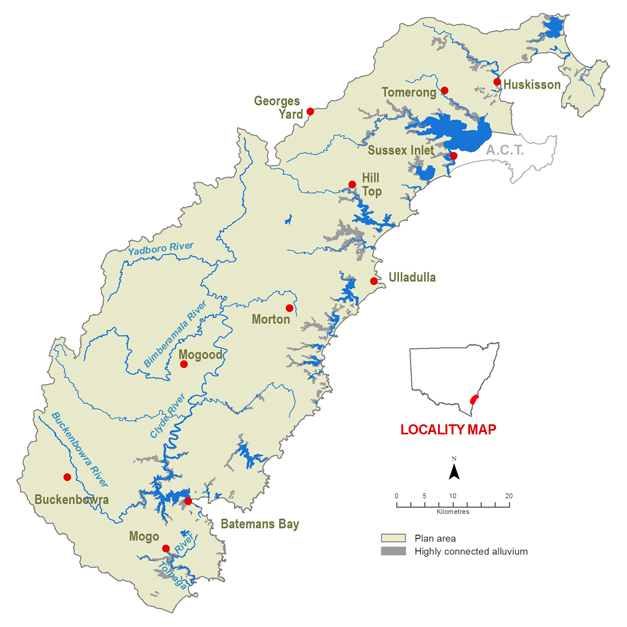 Tributaries of the Clyde River include Bimberamala Creek, Currowan Creek and the Buckenbowra River. Minor coastal river and creek systems account for 40 per cent of the catchment area and include: Currambene, Wandandian and Conjola creeks and Tomago River. View real-time data from the Clyde catchment on this website. Porters Creek Dam with a storage capacity of 1,000 megalitres, is operated by Shoalhaven Water to supply water to Milton and Ulladulla. Eurobodalla Shire Council pumps water from the Buckenbowra River to Deep Creek Dam (4,900 megalitres) which supplies the townships of Batemans Bay and Malua Bay. Shoalhaven Water, Eurobodalla Shire Council, tourism, forestry, cattle grazing, dairy farming, oyster farming and fishing. Most of the rivers and creeks in the Clyde River-Jervis Bay Basin are unregulated, meaning there are no major storages to capture and control flows. Most water users rely on natural flows or small structures, such as weirs for their water supplies. As in most unregulated rivers, flows are mostly affected during relatively dry times, when water is low and demand is high. The management of lands along river and creek banks is an important issue that can affect water flow and quality. For example, cattle grazing can damage sensitive riverbank vegetation resulting in erosion and development along the coastal fringe can alter natural waterways and increase water pollution. 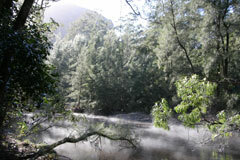 Extensive forest communities and endangered ecological communities populate this catchment. The vegetation of the foreshores helps to maintain the health of the Clyde estuary and the abundance of fish in its waters, which are part of Batemans Marine Park.